This was my first choice for my first NetGalley Advanced Reviewer Copy (ARC), so trust me when I say, I really wanted to give this debut novel more than two stars. The story was good, and I can tell it was deeply personal for Author Eugenia Meliàn. Unfortunately, Wildchilds was not executed well, like reading a proofread first draft rather than a final product. Here’s the deal with Wildchilds: it’s a story about the dark side of the fashion industry, a #MeToo coming out for a sector that has yet to acknowledge its dirty secrets. Wildchilds concentrates on Iris, a former Paris model now living in a sort of exile with her teenage daughter, Lou. When Iris’s former lover—who is also the father of Lou—dies, she’s forced to return to Paris to secure his photography estate for her daughter. In doing so, Iris must confront the hidden demons from her past and the trauma she endured as a model many years ago. Great concept, right? Ms. Meliàn is a former model herself and a veteran agent in the fashion industry, so she gives the reader a real inside look into the profession. However, once I began to read, the story took a turn for the worse. The transitions between points-of-view (POV) and timelines were choppy. At certain parts, Ms. Meliàn transitioned from a third-person POV on one character, to a first-person POV from a completely different character within the same paragraph. Other times, she did not include paragraph breaks, chapter breaks, or character labels when switching POV, creating a sense of daunting confusion for the reader. Often, her dialogue was shallow or repetitive, slowing the story’s pace. Frequently, she’d spend several paragraphs describing the physical attributes of something—a person or a setting—but skirted over the types of important, profound emotions, backstory, or narration readers crave. Her writing usually told, but rarely showed. The result was a feeling of disconnect, of a story that dragged, of one-dimensional characters. This book had so much more potential. I do believe Ms. Meliàn has it in her to turn this novel around and create a magnificent piece of work. Her ability to write well with deep suspense and intensity shone through from time to time, especially during a pivotal confrontation between the main protagonist and her dark antagonist. I would encourage Ms. Meliàn to seek out a strong structural editor who can help to hone her craft and work this book into one that would touch many lives. As it stands now, however, I cannot find it in myself to give Wildchilds more than two stars. I do hope that changes one day. Did you like this review? Then follow me on Goodreads for more like it! If you love Star Wars—maybe. As a forever fan of the original trilogy, and especially of Princess Leia, then saddened over the death of Ms. Fisher, I was expecting much more from The Princess Diarist. Perhaps the sudden death of such a Hollywood icon made the book into more than it was via exaggerated hype. Or perhaps everyone was foaming at the mouth for juicy tidbits on the ever-so-naughty love affair between Ms. Fisher and Harrison Ford that was exposed in the book. But, I don’t know, much of the book just felt … hollow. The whipped cream on top of a flavorful scoop of ice-cream. I wanted more analysis (maybe self-analysis? ), more emotion. I wanted to feel something reading her story. Not to say I didn’t enjoy aspects of it. For example, in the beginning, Ms. Fisher talked about how she never wanted to get into show business because of the way her grandmother treated her mom. I loved this peek into her upbringing and the possible narcissism that surrounded and affected her later in life (I would have loved more of this). I also enjoyed reading snippets of Ms. Fisher’s diary entries from when she was 19 years old and filming the first Star Wars. Today, we know Ms. Fisher was bipolar, and I could detect the increasing manias, followed by the devastating depressive states, in her words. I found that fascinating. I did enjoy learning about her affair with Harrison Ford. The affair was not what you’d expect, and it made me a little sad, in fact. As a Star Wars fan, the tidbits on the making of the film were fun to read, and her insights into fans’ interactions with her (and how that affected her) were eye-opening. I cracked a smile sometimes. Otherwise, I was ready to finish the book about halfway through. I kept hoping for more, a climactic epiphany or ah ha! moment from Ms. Fisher, but I felt like that peak never arrived. Instead, I felt like much of the book was jibbery jabbery filler. Even so, I can’t say I hated the book. I enjoyed it, but it probably won’t stick around in my memory for long. I’m not quite sure when anything with the word “hip” became associated with ME. But apparently, I’ve been labeled a hipster. Problem is, I’m not really too sure what exactly a “hipster” is. OK, to clarify here, no one sprung out from behind the bushes, pointed a slimy finger at my nose, and screamed, “HIPSTER!” As if I’d just robbed a bank. No, if that had actually happened, you’d have heard the frantic 9-1-1 call gone-viral by now. But according to everyone—apparently—if you’re a 30-something, you’re a hispter. WOW. Is my generation really that cool? Well, then again, we ARE the children of the Baby Boomers. Free love people; you can’t get any more “hip” than that! And these people actually raised us. I’m thinking Oscar explained it the best. WHAT DO YOU THINK? 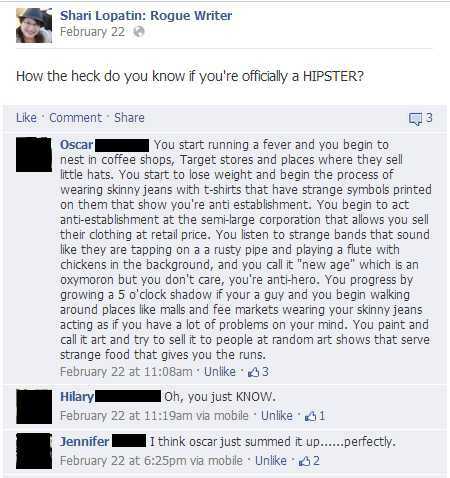 How the heck do you know if you’re a hipster?